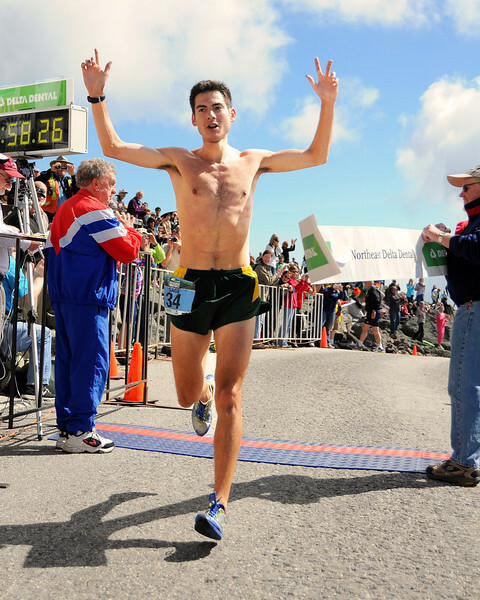 Sage Canaday, of Boulder, raises his hands in victory, after winning the 52nd running of The Northeast Delta Dental Mount Washington Road Race, with an official time of 58:27, in Pinkham Notch, NH, on June 16th, 2012. 1,200 runners raced up the 7.6 mile Mount Washington Auto Road, to the 6,288' summit, tallest peak in the northeastern United States. By winning the event, Mr Canaday also qualified himself for the U.S. Men's National Mountain Running Team.